The Lone Fir Cemetery in Portland is a very peaceful place, and this bench offers a unique place to sit and ponder life. 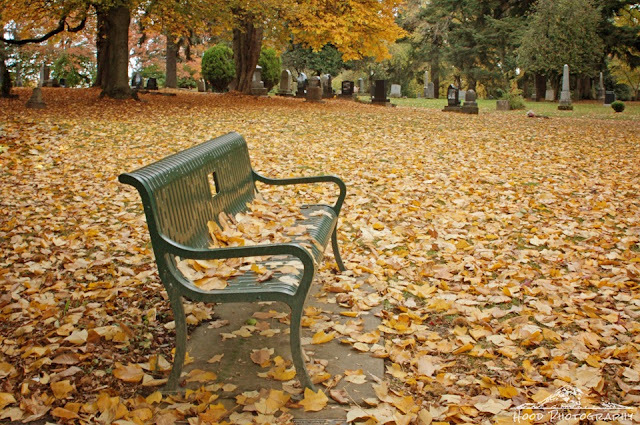 It doesn't look like anyone has chosen to sit here in a couple days, the leaves are undisturbed... love the peacefulness of this scene... Thank you for coming by sharing your creative photography on the Weekly Top Shot, #109! Lone Fir is such a special place. Thanks for reminding me about that with your fine photo. Looks like an amazing place. I like the carpet of leaves! A wonderful carpet of autumn leaf golds. Beautiful scene.